As part of a series of 60 blog posts by 60 bloggers counting down to the 60th Anniversary of Disneyland on July 17, 2015, I am pleased to write about a very magical year in Disneyland history: 1963. The year my two favorite attractions appeared, but only one opened. By 1963 Disneyland was in its eighth year of operation and was turning a profit. An article in the September 1963 New Yorker cited the net profit of the park, before taxes, at $1.5M. Adult ticket sales outnumbered those of children 4 to 1. Disneyland was visited by political leaders from all over the world. WED continued to innovate at a rapid pace, ground-breaking Disney films continued to be released and Walt Disney was more than just a household name - he was a national treasure. 1963 was also a time of great change in America, a country quickly losing its innocence. Dr. Martin Luther King Jr. delivered his famous "I Have a Dream" speech, Beatlemania had just begun, a vaccine for the Measles made it's debut (earlier this year that became a heated topic after a major Measles outbreak at Disneyland), we continued our involvement in the Vietnam War and tragically on November 22nd our President, John F. Kennedy, was assassinated. The following day Disneyland shut down all operations in observance of President Kennedy's passing. The park was heavily evolving in 1963. Main Street U.S.A.: Babes in Toyland Exhibit closes at the Opera House and Mickey Mouse Club Headquarters moves in. Here children could get membership cards to belong to the Mickey Mouse Fan Club. It was during the same time that Disney was showing Mickey Mouse Club reruns on TV. In the 30s, Walt and his wife Lillian made their first of many trips to Hawaii, and they were instant fans of the Polynesian culture. Walt couldn't wait to return to California to animate Mickey Mouse on a surfboard. “Would you like Mickey to come to Honolulu on a surf board? When I go back I will make a ‘Mickey’ on a surf board, as I have been on and off one since coming here, and know just how it feels,” he said. That love of Hawaii and the culture of the islands led to the development of Walt Disney's Enchanted Tiki Room, which opened in 1963. When it opened 1963, it was the first three-dimensional show to feature Audio-Animatronics technology – an invention created and patented by Walt’s company, WED Enterprises. This groundbreaking technology, used to animate birds, flowers and Tiki Gods, would later go on to the World’s Fair and would continue to be implemented throughout Disneyland and, in the future, other theme parks. The same technology being used in rockets at the time, every bird contained air lines and wires, plus a tiny loud-speaker. It’s just animation with sound, run by electronics, Audio-Animatronics. It’s an extension of animated drawings. The Enchanted Tiki Room was originally slated to be a restaurant where guests would be serenaded by birds, but the seating capacity would prove to be a problem and that idea was laid to rest. However, many of you will note that the Tiki Room has its own restrooms and the adjacent Aladdin's Oasis, once the bustling Tahitian Terrace, has its own full kitchen - a testament to Walt's initial idea. Because the Enchanted Tiki Room was owned by WED, it was technically a separate entity from Disneyland and it cost an additional 75 cents to watch the show. 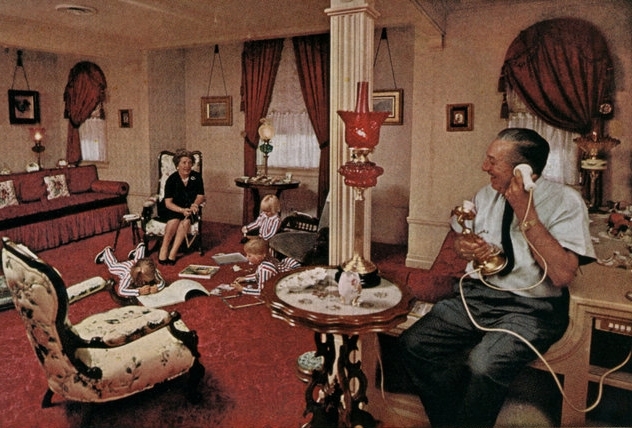 Also of note, because of the amount of computers being used in the attraction, it was the first fully air conditioned attraction in all of Disneyland. It's my favorite place to cool down in the summer, after buying a Dole Whip, of course. Speaking of Dole, they were actually not the original sponsor of the Enchanted Tiki Room, United Airlines was. As seen in the advertisement below, United Airlines offered a helicopter shuttle to Disneyland from LAX. Couldn't we all use that now? 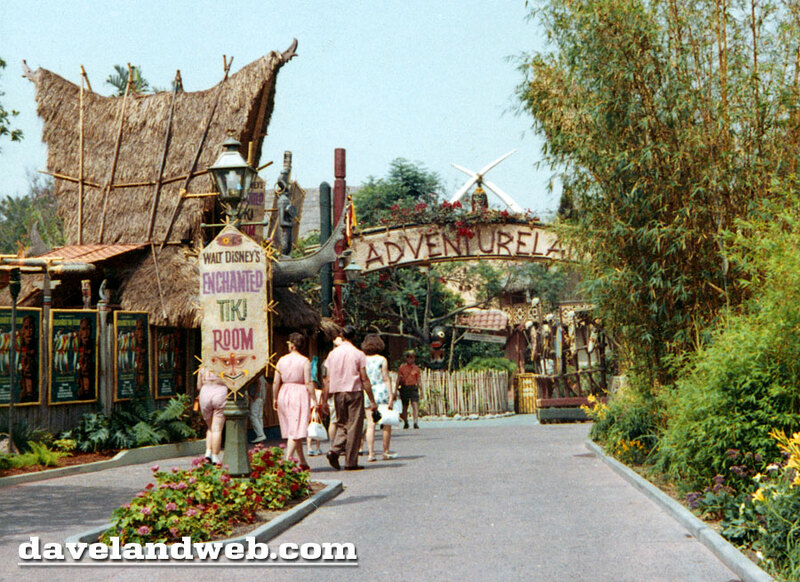 The attraction was an immediate hit, and to this day Tiki and vintage lifestyle enthusiasts like myself visit repeatedly during our trips to Disneyland. The Enchanted Tiki Room is a magical time capsule, a true tribute to Walt and his amazing team of Imagineers. I had the pleasure of meeting Enchanted Tiki Room co-creators Rolly Crump and Bob Gurr during a panel discussion at the Tiki room's 25th Anniversary at Disneyland. Bob spoke to me later in the evening about Autopia and the Enchanted Tiki Room and his relationship with Walt. I was astounded by his respect for Walt and his kind words. Such a huge statement and testament to Walt's leadership and vision. In 1961 handbills were handed out announcing the 1963 opening of a new attraction: the Haunted Mansion. The exterior of the Haunted Mansion was completed in 1963 and the attraction was added to the Disneyland map, however the attraction was incomplete. Not because it was "too scary" as per the rumors of the time, but rather because Walt pulled all the top staff to work on the New York World's Fair projects. 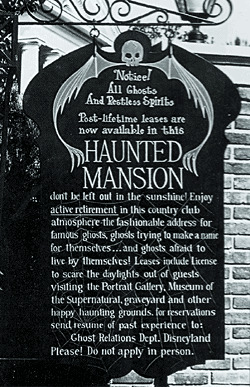 Guests visiting the park were curious about what was inside, and as time passed and more questions grew, a sign was placed on the outside of the gate for visitors stating that Disneyland’s Ghost Relations Department was accepting applications from ghosts wishing to enjoy “active retirement in a country club atmosphere”. Cast Members told visitors who asked when the attraction would open “Walt’s out capturing ghosts for it now.” This would continue for six years. In an interview in 1963, Walt stated that Audio-Animatronic figures were being planned for Disneyland’s French Quarter square in old New Orleans and they would also add chilling realism to the Haunted Mansion in Frontierland. In truth, the complete plans were all up in the air. One idea included a walk through attraction which ended at a Museum of the Weird, that was to be designed by Rolly Crump. Walt even came up to San Jose, CA to visit the Winchester Mystery House for ideas on design. After the World's Fair, the team regrouped and focused on the Haunted Mansion and set an opening date. Unfortunately, Walt passed away in December 1966 before the attraction was completed. In the end, the initial ideas all changed, and The Museum of the Weird was axed. The new technologies developed by WED over the course of the years were an asset to the project, and eventually the walk-through idea was replaced with our beloved Doom Buggies. This video from 1965 shows Walt discussing the Haunted Mansion, which so many guests had already been eyeing since 1963. As a fan of both Walt Disney's Enchanted Tiki Room and the Haunted Mansion, you can see why 1963 was such a fantastic year to me in Disneyland's history. On most days I can't choose a favorite between the two attractions, but the Tiki Room always inches ahead since Walt was there from concept to completion. Walt did leave behind incredible men and women to continue his legacy and I am happy to see Disneyland is still the star.